We used to think it was funny that Donald Trump was the frontrunner when this charade called Con-a-thon 2016 started last summer. 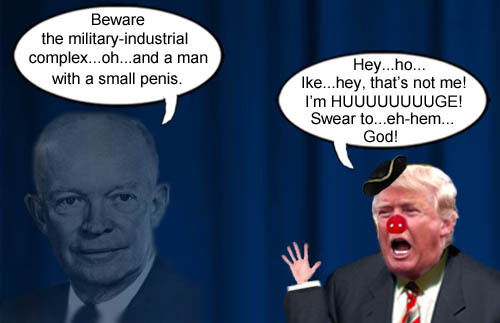 We figured that all his gaffes, miscues and hateful comments would surely lead to his demise before the first primaries and one of the more seasoned ‘establishment’ GOP candidates, like Bush, Walker or Rubio, would take the lead. But Trump is clearly on track to becoming the Republican nominee and it’s becoming more scary than humorous. As a matter of fact the Economic Intelligence Unit(EIU) ranked the prospect of a Trump presidency as one of the biggest threats to global economic stability, right up there with radical jihadists. The most perplexing thing: the supporters of Donald Trump. These are people who should be supporting the man who would really help them, socialist Bernie Sanders. But as we’ve commented here before, many lower and middle class Americans view themselves as ‘temporarily embarrassed millionaires’ , not the exploited backbone of the nation that they truly are. Americans are overworked and underpaid but yet somehow, some of them think that Donald Trump, who is a master at manipulating people and the media, will make their lives better because of the trickle down myth which the Republicans have successfully trumpeted ever since the days of St. Ronald Reagan; Donald Trump is rich, so his riches will trickle down and he’ll make us all rich. It didn’t work in the eighties under Reagan, the aughts under Dubya and it won’t work in the future under Trump. We’ve been hoping that the people who support Trump would have woken up by now, but that doesn’t seem to be the case. In fact, with the outbreak of violence at anybody who speaks against Trump, they seem more adamant than ever to place America into the hands of an authoritarian megalomaniac with a lust for power and a hatred for dissent. 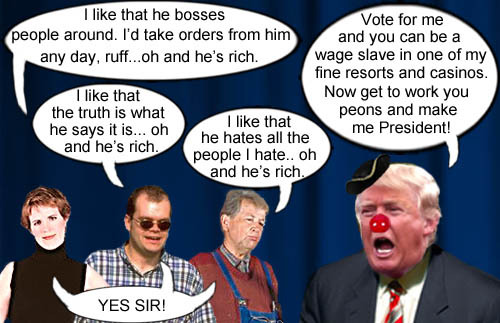 The true future for Trump supporters will more likely be as low wage slaves at his resorts and casinos. Supporters for Donald Trump express their obsequious desire to be future wage slaves for the authoritarian megalomaniac. Well folks, the sham that is Con-a-thon 2016 drags on and it looks like the Republicans are choosing fascism over democracy, as Donald Trump racks up the delegates and the violent thugs. The con that is being pulled on the public not only by the Republican party but the complicit corporate media is mind boggling. The media is reporting that the Republicans are pulling out all the stops trying to stop the orange monster. Even 2012 GOP nominee, Mtt ‘Spiff’ Romney spoke out against the Donald, calling him a fraud. Yes, the Republicans are so concerned that Trump will be the nominee and in typical Republican fashion are blaming President Obama for the rise of Trump. That’s right; in the narrow conservative Republican’s viewpoint, it’s never the fault of a Republican. 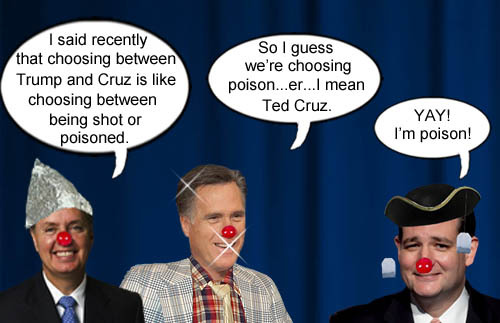 Discerning GOP candidates Ted Cruz, John Kasich and Marco Rubio, a.k.a. 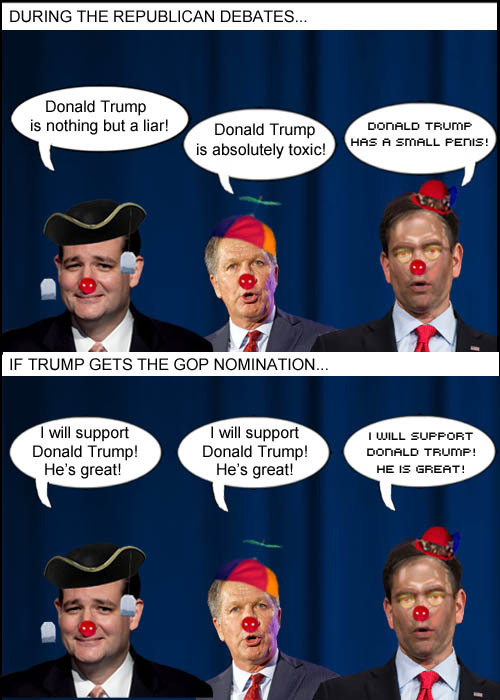 Marcobot 2016, boldly criticize frontrunner Donald Trump as an orange monster but will courageously support him if he gets the Republican nomination. A simple post today…evangelical and Teabagger darling, Dr. Ben Carson, suspended his presidential campaign last week, in the farce that is Con-a-thon 2016, to pursue his true passion…napping. Pleasant dreams, Dr. Carson. It was very interesting to …. zzzzzzzzzzzzzzzzzzzzzzzzzzzzzzzzzzzzzzzzzzzzzzzzzzzzzzz. 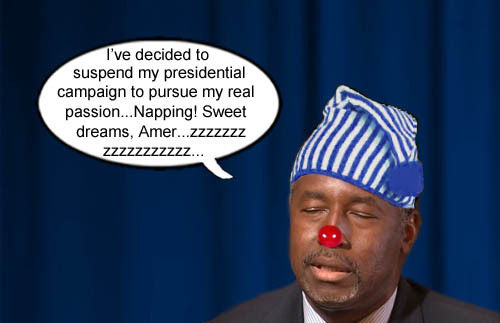 Ben Carson’s campaign summary – zzzzzzzzzzzzzzzzzzzzzzzzzzzzzzzzzzzzzzzzzzzzzzzzzz. Super Tuesday has come and gone and the Trump Express keeps rolling on, much to the chagrin of every sane, responsible American. Trump won seven states in Tuesday’s primaries and is positioned strongly to get the Republican nomination in the colossal clusterf*ck that is Con-a-thon 2016. Endorsements keep coming in as well for the Donald. Among the endorsements this past week, was one from former Louisiana Representative David Duke, who also used to be a Grand Wizard of the Ku Klux Klan. In an interview on CNN, Trump passed up a chance to disavow Duke, saying that he didn’t know Duke. The thing is that Trump does know who is Duke is and he manipulated the media in typical Trump (and conservative) fashion – deny, blame others and blow his own horn. In the joke that was Con-a-thon 2012, we posted an article about a possible brokered convention where a ‘white knight’ candidate would come rushing in to save the GOP. Well, that ‘white knight’ is here in Con-a-thon 2016 for the Republicans and the KKK alike and his name is Donald Trump. Don’t let the media reports fool you; if Trump keeps winning and shows that he’s “the people’s choice”, then you better believe that the so-called ‘establishment’ will endorse him. Power is power and the moneyed elite will love having one of their own at the controls in Washington. Face it; Donald Trump is the face of the modern Republican party. Welcome to Hell, America! 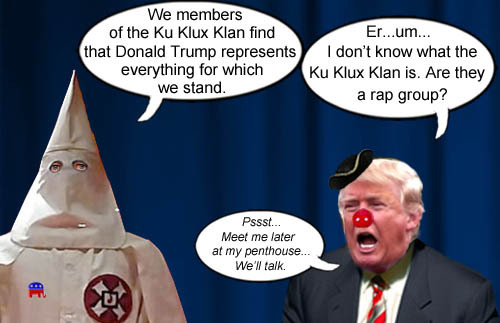 GOP frontrunner and Master of the Con, Donald Trump, deftly deflects knowledge of the Ku Klux Klan while simultaneously keeping open lines of communication with the white supremacist group.